Wow, it’s been a month since I posted a recipe!!! The last one just so happened to be these Mini Donuts for The Recipe Redux’s birthday! I know, you’re so upset, huh? Well, fret no more, it’s The Recipe Redux time and I’m back with another for you! This month we were challenged to use the slow cooker, instant pot or another kitchen gadget that kept the house cool, calm and collected! Since I was traveling so much the past month, I really was struggling with what I would create! I literally was home three days in between Switzerland and then hitting the road for work, so knew whatever I made had to be able to be frozen, too! 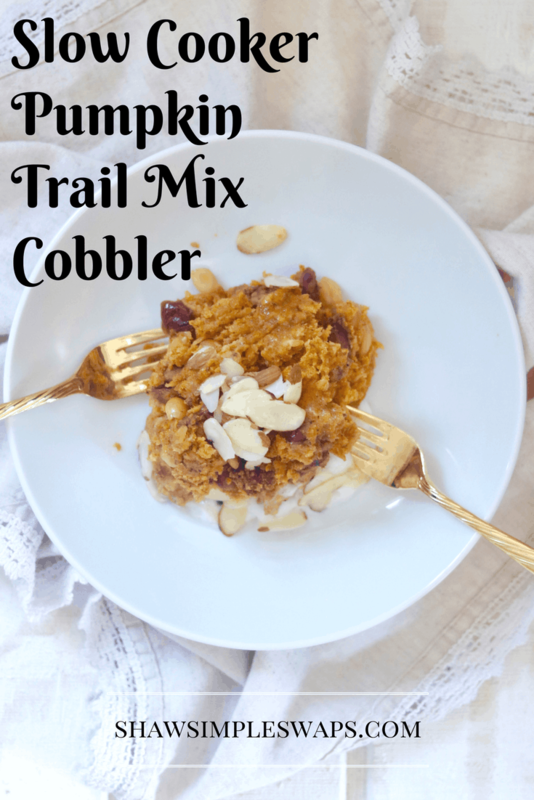 Enter, this Slow Cooker Pumpkin Trail Mix Cobbler! No, it’s not fall, yet, I know. Also, I knew I could freeze this and it would hold up pretty well based on prior experiments with pumpkin. So, a little test here for Mr.CEO (let’s see if he reads these). There’s approximately 6 pre-portioned containers in the freezer for you when you get back from Switzerland and I’m gone for work. You’re welcome. Okay, okay, back to the recipe now! In less than 10 minutes you can whip this baby up and set your slow cooker to high and step away from the kitchen. Come back two hours later to a glorious smell of fall with hints of cinnamon, pumpkin and of course, nutmeg! And, since it’s ice cream month too, you can easily make this a summer delight by topping with a scoop of vanilla ice cream too! The possibilities are endless. Now, what are you waiting for?! Take out that last can of pumpkin from your CANtry and lets get slow cookin’! 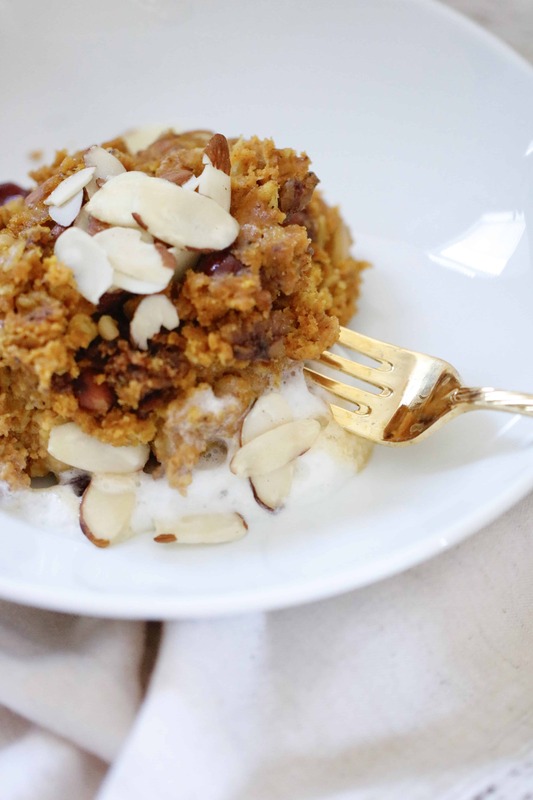 Combine pumpkin puree and ground flaxseed in a medium bowl. Stir in the canola oil and agave sweetener, set aside. 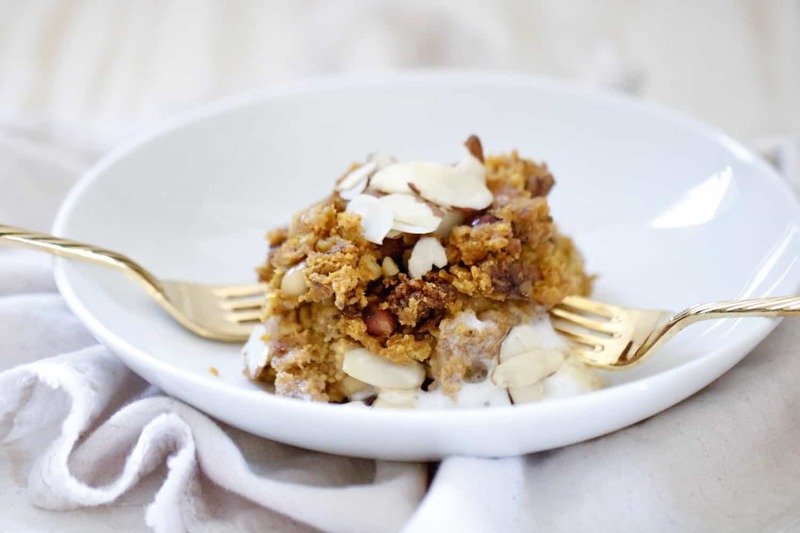 In a larger bowl, mix flour, oats, baking powder, and spices together. Slowly add in the flour mixture to the pumpkin puree until uniformly combined. 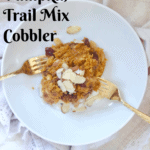 Stir in the trail mix and set aside. Line a slow cooker with aluminum foil and spray liberally with cooking spray. Pour in the pumpkin mixture and set to high. Cover with the lid. Cook for 2 hours or until set. Remove and serve with a dollop of whipped cream and a drizzle of caramel sauce. Check out the other lovelies recipes below, too! Everything about this sounds delicious! And not gonna lie, the pumpkin has me REALLY excited for fall! (Well that and the excessive heat haha). Great recipe, Liz! LOL Thanks Lindsey! SO ready for fall too! Yum! I can only imagine how delicious this made your kitchen smell! Definitely would be great with ice cream, too! Pumpkin goals! My favorite kitchen appliance next to my coffee maker is my slow cooker. ?